You can't go wrong with our 15 day money back guarantee! 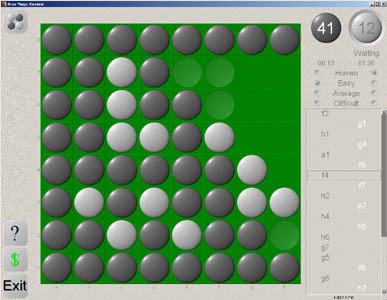 Reversi is a classic game played on an 8x8 board. It may have originated in the far east, though it became popular in some parts of Europe in the nineteenth century. There are two players -- black and white. Play goes in turn, where each player places one piece of their color on an unoccupied space on the board. This placement must result in flipping at least one opponent piece. If no such placement is possible, the player must pass their move. If both players pass one after the other, the game is over (this typically occurs when the whole board is full). The winner is the player with most pieces at the end of the game. When black is placed on X, it flips all four white pieces to black. Flipping occurs when opponent pieces are trapped by the newly placed piece and another pre-existing piece on the board. The opponent pieces must be in a continuous line. Horizontal, vertical and diagonal directions are considered. Aros Magic games feature beautiful full screen graphics. They are easy on your eyes and on your wallet. Partial: العربية, 中文, Deutsch, Français, Ελληνικά, עברית,हिन्दी, Italiano, 日本語, 한국어, Nederlands, Norsk, Português, Русская, Suomi, Svensk, ไทย. © 2005-2008 Aros Magic. All rights reserved. No warranty is implied or expressed. Use our software at your own risk. Void where prohibited.